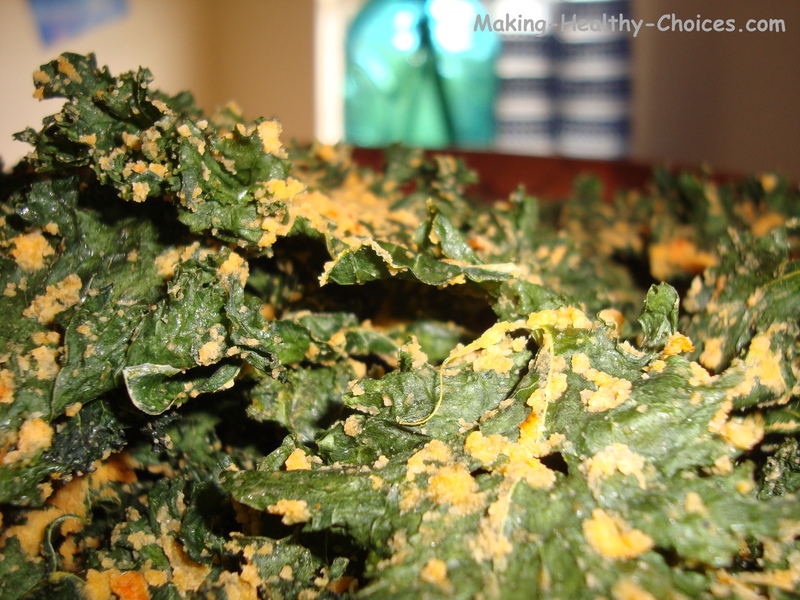 Kale chips are raw, vegan, healthy and delicious. They are a great, healthy alternative to potato chips. Build up your repertoire with many healthy snack recipes and it will be much easier to stay away from all of those unhealthy packaged snacks. Kale is abundant in nutrients such as calcium, vitamin K and vitamin C and has many cancer fighting properties. There are many varieties of kale and I encourage you to experiment with them all. When making kale chips, my favourite tends to by curly kale. Basically, kale chips are made by simply dehydrating bite size pieces of kale until they are crispy. Before dehydrating you can coat the chips to give them a specific flavour. The ideas for coatings are endless, be inspired by this page or by others' recipes and play around to come up with your own ideas. 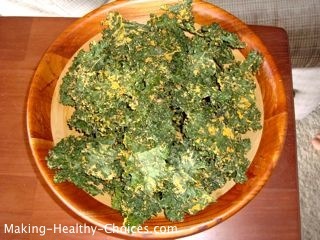 Also try dehydrating kale pieces with no coating at all! This allows you to have a crispy snack that highlights the flavour of the kale itself. Break kale away from the stem into pieces, wash and set aside. Wash and cut bell pepper into big chunks. In blender (I use a Vitamix Blender) combine bell pepper and macadamia nuts with a pinch of sea salt and cayenne pepper. Blend well and taste. Adjust sea salt and cayenne pepper to taste. You may need to add a tiny bit of water if the sauce is too thick. As with all raw food recipes, it is important to taste and adjust. Because you are using fresh organic ingredients your recipes may come out slightly different at different times depending on the changing sweetness of your ingredients. With this recipe for kale chips, bell peppers can vary in colour and slightly in taste depending on where they are grown and the time of year. Coat each piece of kale with the sauce and place on dehydrator trays (I use an Excalibur Dehydrator). Dehydrate until crispy (about 4-5 hours). 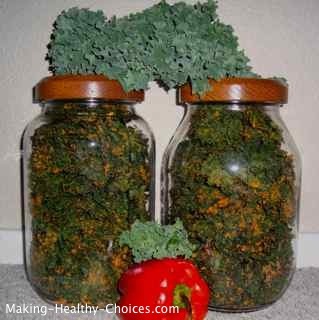 If you don't have a dehydrator you can try putting your oven on its lowest setting, keep the door slightly ajar and place the kale on a cookie sheet. I did this before I got a dehydrator but it is much more time consuming and the chips won't be as tasty as many of the taste giving nutrients are destroyed by the higher heat. Wash and break kale away from the stem into bite size pieces. 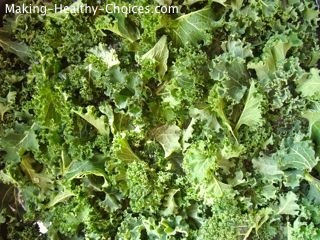 Place kale in a large bowl and mix in oil and salt. Once kale is coated, dehydrate until crispy. This recipe makes a nice salty and crunchy chip that is also full of nutrition ... a great alternative to packaged potato chips that contain many unhealthy ingredients.